The Custom tool icon shows commands that allow you to define and use custom tools. When you press and hold the Custom tool icon, the Custom tools menu appears. Custom tools are tools that you create yourself or that other Sketchpad users create for you. In just the way that Sketchpad’s Compass tool constructs a circle given its center and radius point, custom tools that you create can construct figures of arbitrary complexity. For example, you can make a custom tool that constructs the perpendicular bisector of a given segment, or one that constructs the circumcircle of a given triangle, or one that constructs a square given two adjacent vertices. A more advanced custom tool might create a fractal, or a tangent to an arbitrary point on a function plot, or a complex tessellation. Any custom tool you define can be used an unlimited number of times in an unlimited number of sketches. By defining new custom tools, you extend the built-in tools available to you in Sketchpad. Since you can create any type or number of custom tools you wish, the possibilities for extending Sketchpad’s tools are limitless. 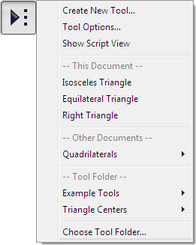 Tools that you create reside inside the document in which you create them. You can always use them in that document (unless you remove them from that document) just as if you were using a built-in tool like the Compass or Straightedge. When a document containing custom tools is open, you can also use those tools in any other open document. Finally, you can designate or create a special Tool Folder to store frequently used tools. Tools stored in your Tool Folder will be available whenever you start Sketchpad, even when the documents that contain them are not open in Sketchpad.